–Broken our personal long-distance hiking record. –Have less than 2,000 miles to go. 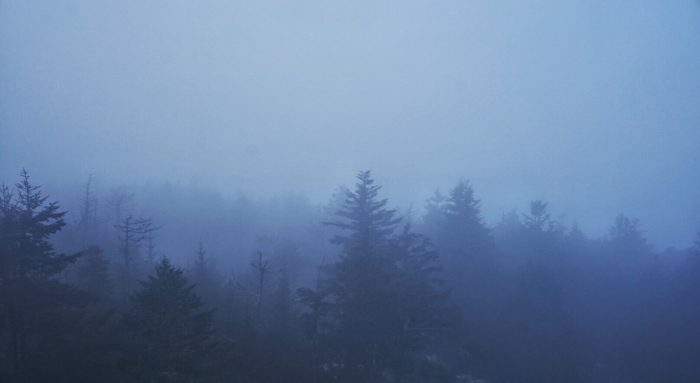 –Walked to the highest point on the trail (the top of Clingmans Dome at over 6,000 feet). –Spoiler alert: Officially made it farther than Bill Bryson did in “A Walk in the Woods” (according to a man in Gatlinburg). –Started hitting our 15-mile-a-day target. 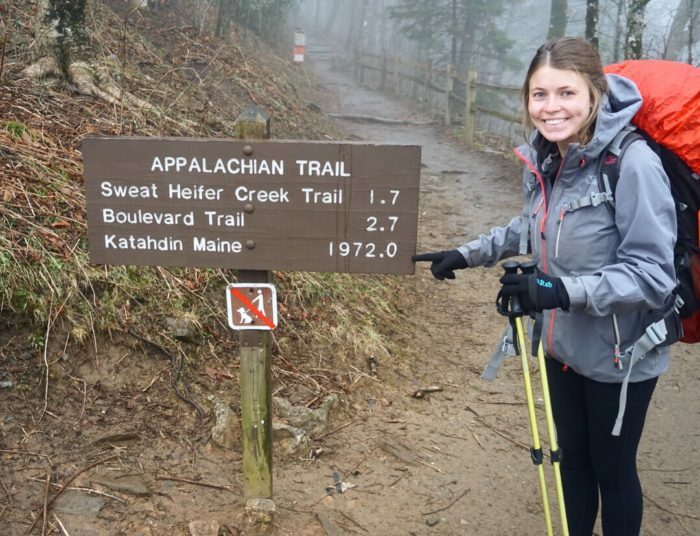 –Made it through the Smokies (the mountain range that according to the folks at Top of Georgia hostel has broken 50 percent of attempting thru-hikers over the past two years). Finally out of the 2,000s! And even less than that to go now. All that said, though, we really have earned those victories – the Smokies were tough and I can see why so many people find them so trialing. Thankfully we went into the Smokies well-rested and with a sensible mind-set. We’d taken a day off to recover, let the bad weather pass (or so we hoped), and resupplied at Fontana Dam the day before, so we were fresh-faced for the journey ahead. So many people said that the hardest days of the Smoky Mountains were the day you went in, and the day you left, just because of the sheer elevation gain and loss, so with full packs and determination we prepared ourselves for a tough day ahead. It was foggy and wet, but our first day into the mountains was genuinely enjoyable. The gradient was far easier than anticipated (thank goodness!) and the surroundings were out of this world. If trying to mentally picture it, all I can say is try mixing Middle Earth (“Lord of the Rings”) with Narnia and Mount Olympus. The elevation was so high that it literally felt like we were in the clouds and almost part of the weather. It was incredible. We took our time but thankfully we made it to our destined shelter a little after 4 p.m., but we felt good for the miles (13) and elevation we did that day. Camping in the Smokies works a little differently than the usual camping as you need a permit to stay at the shelters. Thru-hikers have a permit that lets them stay at any shelter during their stay in the park (a maximum eight days is allowed), but that’s only if there is enough room after any section hikers (hikers staying a couple of days) have arrived. Sadly for us on that first day, more section hikers arrived than there were spaces in the shelter, so as we were the last in, we were the first out. Dammit. This meant that we had to walk a farther 3.3 miles to the next shelter, and to make it worse, a thunder and lighting storm had just started. I don’t think that Buck and I have ever covered the ground so quickly! Counting the seconds between flash and bang to try to work out if we were in range or not, while frantically reciting the procedure of what to do if we were about to be struck by lightning, we practically jogged to the next shelter as hail pelted down on us. A long and testing day, but boy did we sleep well that night. The next day we hoped to keep the high mileage up as the gradient looked easier and the weather was supposed to be reasonable, but I think this let us fall into a trap of false hope. For some reason my legs were just not playing ball that day and they felt heavy and slow. To make matters worse, the gradient was of course not as flat as we thought it looked in the guidebook and so we made very, very slow progress. Nothing gets your mood down more than when you have to stop for lunch and you have more miles in front of you than you do behind you. We soldiered on that day, but had to stop 1.7 miles short of our 16-mile day because morale was low and feet were pounding. This did, however, reunite us with some of our trail family, so that was a silver lining to a very gray cloud. We managed to pitch our tent that night, as camping at the shelter was allowed, and we got ready for the next day – reaching the highest point on the trail. Not quite the view we were expecting. Nonetheless, we made it, and we quickly proceeded to head back down to Gatlinburg to resupply. As always, this was not quite as easy as it sounded as the snow that had plagued the mountains earlier in the week had started to melt and then froze again, leading to a luge-esque descent from the top of the mountain. Don’t worry, we made it down in one piece, but it took a bit longer than hoped. After all that, I think the Smokies felt bad for us and so made our last couple of days in them fairly mild and uneventful. Sadly, we never did get to see the beautiful views that they are supposed to display, but we loved the change in scenery that they brought and the unity with our fellow hikers. 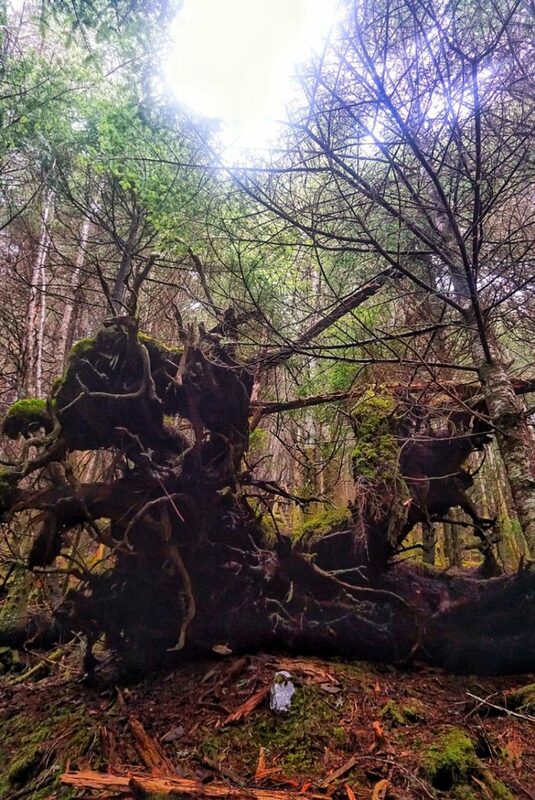 A Tolkien-worthy tree fallen in the Smokies. We are now 30 or so miles on from the Smoky Mountains (274.5 miles in total) and although sad to have missed their views, glad to have them behind us. Next milestone is Damascus and we are ready for it. Keep it up and keep smiling. After the worse days like in the Smokers there will always be awesome smiles ahead. Great post. Keep it going and soak it all in. Good job in really, really tough conditions. You’ve got this, hang tough.